A thin wash of glaze. A few months ago I discovered that M&S had started selling gluten free scotch eggs and they swiftly became the go-to day trip lunch item. 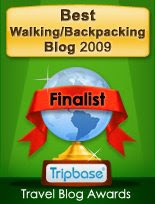 At the time there was also some jokey dialogue going on a forum about what happened to those good old climbing/hiking food items like scotch eggs, pork pies and garibaldi biscuits. 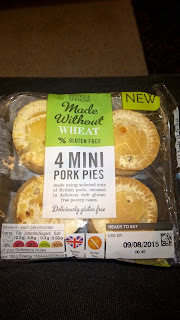 They had, for some, fallen out of fashion to ‘healthier’ options but for me the exclusion was a dietary one – I could no longer eat them. 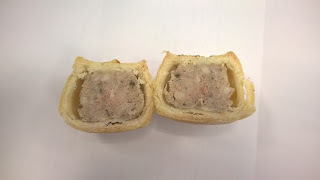 Imagine my surprise and joy when I discovered that M&S are now doing pork pies and it goes without saying that I was scouting scotch eggs at the time, so grabbed a packet of these too. 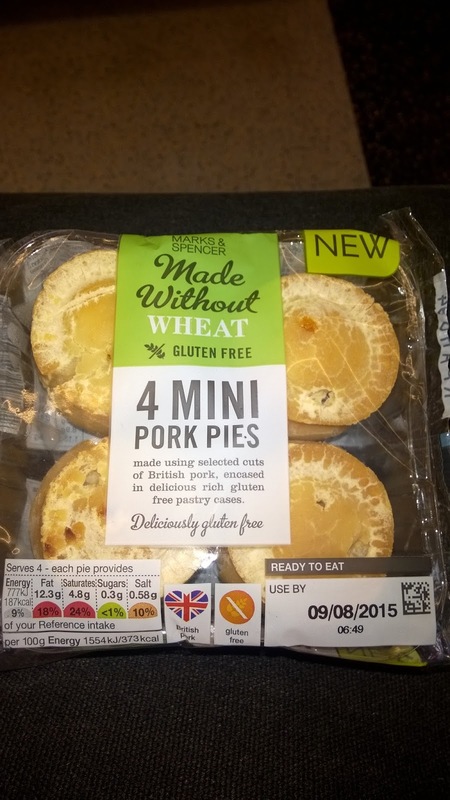 There are four mini pies in the pack weighing in at 50g each, and have the following food values 777KJ of energy, 12.3g fat, 14.3g of carbohydrate (CHO) and 4.5g of protein. And a pack of four cost circa £2.40. Being made from gluten free pastry I have to be forgiving, a bit, but I found the pastry a bit too dry. There didn’t seem to be sufficient fat content in the pastry to make the kind of crusty shell that pork pies are known for. There was an insufficient amount of glaze or lack of it on the pastry too. And the same can be said for the jelly which again is a key part of the pork pie experience. The first didn’t have any jelly and the remaining three had a small amount in the bottom of the pie with air space above. But not enough of it before it was lost. This is down to the fact that their size and the manufacturing process, no doubt. The filling again didn’t amount to much in volume but tasted well enough. After the success of the scotch eggs I was disappointed by how these turned out. Personally I would rather have larger pies either 250g or even 500g sized ones that would have the space between the crust and filling for decent amount of jelly and would obviously contain an equally decent amount of meat too.